We call the process we have designed to help our personal clients The Vision Advocate Experience™. The intent behind the name is to impart clearly, from the start, how we see our role when it comes to your personal finances. We take the position that we are an advocate for our client relationship. We operate on the premise that there are always two experts in the room—you, the client, and us—and we create the space and time for you to think deeply about what is most important to you. Our objective is to help you develop clarity about your vision for the future, and to provide you with a comprehensive process to achieve it. As our relationship deepens over the course of the years, we look forward to supporting your growth and serving you in any way we can. Human Life Value is a measurement of the value of your contribution, in the form of earnings, benefits, and retirement contributions, to your family or your business. We use this powerful concept as part of the Vision Advocate Experience™, to provide you with a risk management strategy that fits your specific needs. 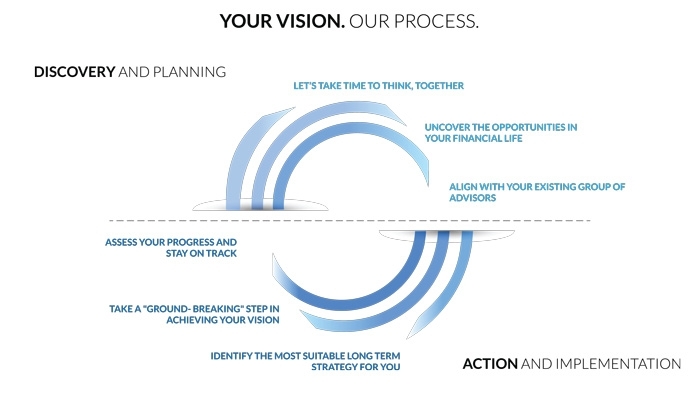 The Vision Advocate Experience™ allows you to develop a clear, effective strategy for managing and growing your assets. As your financial advocate, we place your needs first in evaluating any investment decision. Whether discussing a rollover of your retirement plan balance or initiating an education funding strategy, we seek to clearly understand your objectives, evaluate your options, and present you with a recommendation that suits your unique vision.